high-molecular natural compounds that form the structural base of all living organisms and play a determining role in life processes. Biopolymers include proteins, nucleic acids, and polysaccharides. There are also mixed biopolymers—for example, glycoproteins, lipoproteins, and glycolipids. Biological functions of biopolymers. Nucleic acids perform genetic functions in the cell. The sequence of monomer units (nucleotides) in deoxyribonucleic acid (DNA)—sometimes in ribonucleic acid (RNA)—determines (in the form of a genetic code) the sequence of monomer units (amino-acid radicals) in all the proteins to be synthesized, and consequently the structure of the organism and the biochemical processes that take place therein. When a cell divides, both daughter cells receive a full set of genes because of the preceding spontaneous duplication (replication) of the DNA molecules. Genetic information is transmitted from DNA to RNA, which is synthesized on DNA as if on a matrix (transcription). This so-called messenger RNA serves as a matrix for synthesizing protein in special cell organelles—ribosomes (translation)—with the participation of transfer RNA. The biological variability essential for evolution is realized at the molecular level because of changes in DNA. Proteins perform several major functions in the cell. Protein enzymes carry out all the chemical reaction of metabolism in the necessary sequence and at the necessary speed. The proteins of muscles, flagellates of microbes, cell villi, and so on perform a contractile function, converting chemical energy into mechanical work and ensuring the mobility of the organism as a whole or of its parts. Proteins are the basic material of most of the cell structures (including special types of tissues) of all living organisms and the membranes of viruses and phages. Cell membranes are lipoprotein membranes, ribosomes are constructed from protein and RNA, and so on. The structural function of proteins is closely related to the regulation of the entry of various substances into subcellular organelles (active ion transport and other processes) and to enzymic catalysis. Proteins also perform regulatory functions (repressors), “prohibiting” or “allowing” the manifestation of a given gene. In the highest organisms there are proteins, which are the transporters of various substances (for example, hemoglobin, the transporter of molecular oxygen), and immune proteins, which provide protection against foreign substances entering the body. Polysaccharides perform structural, reserve, and some other functions. Proteins and nucleic acids are formed in living organisms by matrix enzymic biosynthesis. There are also biochemical systems for the extracellular synthesis of biopolymers that use enzymes isolated from cells. Methods have been devised for the chemical synthesis of proteins and nucleic acids. Primary structure of biopolymers. The composition and sequence of the monomer units of biopolymers determine their so-called primary structure. All the nucleic acids are linear heteropolymers—sugar-phosphate chains to units of which side groups are attached (for example, nitrogen bases: adenine and thymine [uracil in RNA], guanine, and cytosine); in some cases (mainly in transfer RNA) the side groups may consist of other nitrogen bases. Proteins are also heteropolymers. Their molecules are formed from one or more polypeptide chains connected by disulfide bridges. Polypeptide chains consist of 20 different kinds of monomer units—amino acid radicals. The molecular mass of DNA varies from several million (in small viruses and bacteriophages) to 100 million or more (in larger phages). Bacterial cells contain one DNA molecule each with a molecular mass of several billion. The DNA in higher organisms may have an even larger molecular mass, but it has been impossible thus far to measure it because of breaks in the DNA molecules that result when they are isolated. Ribosomal RNA has a molecular mass ranging from 600,000 to 1.1 million; messenger RNA, from hundreds of thousands to several million; and transfer RNA, about 25,000. The molecular mass of proteins varies from 10,000 or less to millions. In the latter case, however, is it usually possible to separate the protein particles into subunits connected by weak, mostly hydrophobic, bonds. Conformation. Conformation—that is, one or another spatial form of the biopolymer molecules—is determined by their primary structure. Depending on the chemical structure and external conditions, the molecules may be in one or more preferred conformations (the native states of biopolymers are usually found in natural conditions—for example, the globular structure of proteins, the double helix of DNA) or they may assume many conformations of more or less equal probability. Proteins are divided according to their spatial structure into fibrillar (strandlike) and globular. Protein/enzymes, protein/transporters, and immune and some other proteins generally have a globular structure. For a number of proteins (such as hemoglobin, myoglobin, lysozyme, and ribonuclease) this structure has been determined in all details, with the position of every atom established by X-ray diffraction analysis. It is determined by the sequence of amino-acid radicals and is formed and supported by relatively weak interactions between the monomer units of polypeptide chains in a water-salt solution (Coulomb and dipole forces, hydrogen bonds, and hydrophobic interactions) and by disulfide bonds. A protein globule is formed in such a way that most of the polar hydrophilic amino-acid radicals are on the outside and come into contact with the solvent, but most of the nonpolar (hydrophobic) radicals are inside and isolated from interaction with water. Protein molecules having an excess of nonpolar groups, when a part of them is on the surface of the globule, form the highest (so-called quaternary) structure, in which several globules aggregate and interact mainly with the nonpolar portions (see Figure 1). The spatial structure of each protein/enzyme is unique, and it ensures the position in space of all the biopolymer units—especially the so-called active centers— which is essential for the functioning of the protein. At the same time, the structure is not absolutely rigid; it permits conformational shifts and changes that may be necessary for the protein to function when interacting with substrates, inhibitors, and other substances. Figure 1. Formation of quaternary structure of globular proteins. 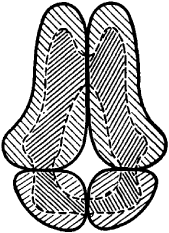 Lightly crosshatched—polar (hydrophilic) parts of protein globules; heavily crosshatched—nonpolar (hydrophobic) regions. Watson. Opposing nitrogen bases in it are connected in pairs by hydrogen bonds—adenine to thiamine, and guanine to cytosine. The stability of the double helix is guaranteed both by the hydrogen bonds and by the hydrophobic interaction between the flat rings of nitrogen bases arranged in a stack (stack interaction, or stacking). The RNA strands are only partly spiralized. The DNA of viruses, bacteriophages, and bacteria—and mitochondrial DNA—is in some cases a closed ring; in addition to the Crick-Watson helix there is an additional helix—so-called superspiralization. units depend on the conformation of the adjacent units because of intramolecular interactions. The denaturation of biopolymers following a change in external conditions is usually based on cooperative conformation transformations (for example, α-coil-β-structure, α-helix-coil, and β-structure-coil transformations for polypeptides; globule-coil transformation for globular proteins; and helix-coil transformation for nucleic acids). Unlike phase conversions (boiling of liquid, melting of crystal), which are extreme cases of cooperative processes and occur abruptly, cooperative transformations of biopolymers are effected in a finite—although comparatively narrow—interval of changes in external conditions. In this interval, undimensional, linear molecules (nucleic acids, polypeptides) that undergo the helix-coil transformation break down into alternating helical and coiled parts (see Figure 3). The helix-coil transformation in DNA occurs after a rise in temperature or the addition of an acid or alkali to the solution, or under the influence of other denaturing agents. Such transitions occur in homopolynucleotides after heating in an interval of tenths of a degree C, in phage and bacterial DNA in an interval of 3°-5° C (Figure 3), and in DNA of higher organisms in an interval of 10°-15° C. The greater the heterogeneity of the DNA, the wider the transition interval and the smaller the capacity of the DNA molecules for renaturation. 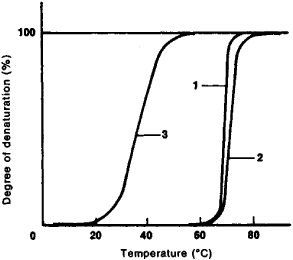 The helix-coil transformation in different kinds of RNA is of a less cooperative character (see Figure 4), and it occurs in a wider interval of temperatures or other denaturing agents. Figure 3. 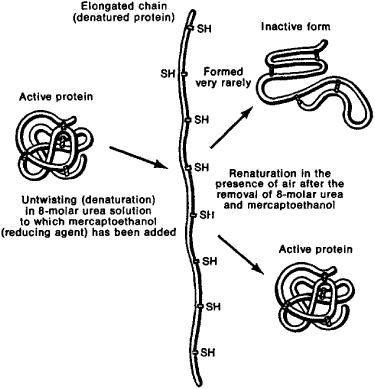 Diagram showing helixcoil transformation for DNA: (1) native state (a “rope ladder” is shown instead of a double helix for the sake of simplicity), (2) state of DNA in the region of transformation, (3) denatured state (single-strand coils). the degree of ionization of the molecule and on the electrostatic interaction between individual parts of the molecule and between the biopolymers and the solvent. Figure 4. 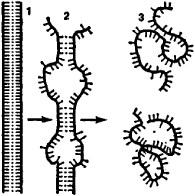 Curves of the helixcoil transformation (denaturation) of nucleic acids from various organisms: (1) bacterial DNA, (2) DNA from calf thymus, (3) tobacco mosaic virus RNA. the preservation of genetic information in all these processes. On the other hand, the relatively weak bonds between the DNA strands and the possibility of rotation around simple chemical bonds ensure the flexibility and lability of the spatial structure that are needed to separate the strands during replication and transcription, as well as the mobility of the messenger RNA molecule which acts as a matrix in protein biosynthesis (translation). The study of the spatial structure and conformational changes in the protein/ enzymes at different stages in the enzymic reaction during the interaction with substrates and co-enzymes makes it possible to ascertain the mechanisms of biocatalysis and understand the nature of the tremendous acceleration of the chemical reactions catalyzed by the enzymes. Methods of investigating biopolymers. In investigating the structure and conformational metamorphoses in biopolymers, extensive use is made of both purified natural biopolymers and synthetic models thereof that are structurally simpler and easier to study. For example, homogeneous or heterogeneous polypeptides (with predetermined or random alternation of amino-acid radicals) serve as models in the study of proteins. Corresponding synthetic homogeneous or heterogeneous polynucleotides serve as models of DNA and RNA. Among the means used to investigate biopolymers and models thereof are X-ray diffraction analysis, electron microscopy, the study of absorption spectra, optical activity, and luminescence, methods of light scattering and dynamic birefringence, the sedimentation method, vis-cometry, and physicochemical methods of separation and purification. All the techniques devised for the study of synthetic polymers are also applicable to biopolymers. The methods of theoretical physics (statistical physics, thermodynamics, quantum mechanics, and so on) are used to interpret biopolymers, models of biopolymers, and patterns of conformational metamorphoses therein. Bresler, S. E. Vvedenie ν molekuliarnuiu biologiiu. Moscow-Leningrad, 1956. Vol’kenshtein, M. V. Molekuly i zhizn’. Moscow, 1965. Fizicheskie metody issledovaniia belkov i nukleinovykh kislot. Moscow, 1967. The bioplastics & biopolymers market is projected to witness a CAGR of 12. These chitosan (biopolymer) technologies will complement our plant-based biopolymers. US-based industrial biotechnology company TerraVerdae BioWorks has entered into a strategic partnership agreement with PolyFerm Canada, a Canadian biopolymer company focused on developing renewable and biodegradable alternatives to petrochemical-based elastomers, the company said. Through the alliance, Metabolix's Mirel polyhydroxyalkanoate (PHA) biopolymers will be developed as part of Honeywell's Asensa line of personal care additives to help address pending legislation in the US focused on replacing synthetic, non-biodegradable microbeads, as well as global demand for biobased and biodegradable alternatives. Dig into these figures, though, and you discover that certain biopolymers are loved much more than others. The current efforts in the development of new technologies for implementation of sustainable biopolymers in the real market of antimicrobial textiles do not guarantee economical viability yet," the paper says. FALMOUTH, Maine -- Smithers Rapra is pleased to announce that NatureWorks, Metabolix, Virent, First Green Partners, the National Restaurant Association and Green Dot Holdings headline the agenda for the 8th annual Biopolymers Symposium. Despite the fact the functionality of chitin derivatives spans across various applications, ranging from dietary' supplements to healthcare, these biopolymers remain an underutilized resource. The physical texture and the morphology of the biopolymers of azelaic acid cross-linked chitosan and collagen was assessed using physical touch followed by scanning electron micrograph. Goodfellow (Oakdale, PA) has assembled a range of biopolymers to address growing demand from product developers. The prevalence of biopolymers in disposable markets has increased significantly in the past decade.